"By offloading intensive processing tasks, such as fast Fourier transform (FFT) and modulation/coding, to USRP’s built-in FPGA, we increased the determinism, signal integrity, and reliability of the system whilst freeing up the host processor for data logging and simpler processing tasks such as visualising power spectrum and constellation diagrams." We needed to implement a cost-effective low-altitude aerial testbed that can verify novel wireless communications applications between the airborne node and ground terminals while meeting tight constraints for payload weight, volume and power consumption. We combined the rapid prototyping capabilities of the LabVIEW Communications System Design Suite with the processing power of USRP RIO to directly drive tailored antenna elements in a highly flexible wireless testbed. The testbed is carried onboard a tethered aerial platform Helikite that can be deployed for hours, up to 400 meters altitude, which allows us to trial multiple applications. Today, many people see access to broadband multimedia wireless services as a utility. At the beginning of 2017, 98% of the UK population had mobile coverage, driven by regulatory requirements that an operator covers at least 95% of the population. However, only 70% of the UK landmass is covered, as Figure 1 illustrates. Remote areas of Scotland, British National Parks, and Areas of Outstanding Natural Beauty are underserved with poor quality or no Internet and, in many cases, no mobile coverage. This occurs for two main reasons: the cost of delivery and restrictions such as planning. The UK government has committed £440M to provide broadband to 600,000 rural homes (approximately £750 per home) . Extending 800 MHz wireless coverage to 99% of rural areas was anticipated to cost £270M in 2012 . Clearly, our present approaches are costly. The lack of suitable wireless infrastructure creates a technological divide. Smart cities are increasingly receiving funding with creative ideas given for the Internet of Things (IoT), monitoring, and control. In rural areas with limited coverage, smart villages and farms are still a long way off, along with applications such as soil mapping, fertiliser and pest control, fleet management, and precision livestock farming, including sheep tracking, smart feeding and milking of cows . High-altitude platforms (HAPs) can solve the civil planning and cost issues of serving such areas by filling coverage gaps and working alongside existing and future terrestrial infrastructures in the cities. HAPs, taken here to mean unmanned aircraft located at an altitude of 17 km–22 km, are poised to become reality within the next two years given several well-funded activities and advancements in the key enabling technologies of materials, battery and energy capture. The Communication Technologies Research Group at the University of York has been conducting research to tackle such challenges since 1999 through theoretical and practical work. In 2016, the university launched the Centre for High Altitude Platform Applications (CHAPA) to capitalise on this new generation of delivery platforms. It is important to have a readily accessible test facility for early prototyping and trials. CHAPA started conducting wireless experiments using a USRP-based solution that is attached to a 21 "m" ^"3" Helikite - a tethered helium balloon that can carry a 10 kg payload up to 400 meters altitude. We used USRP (Universal Software Radio Peripheral) devices to drive our bespoke antenna elements for our various trials, programmed with the LabVIEW Communications Systems Design Suite. We can use this floating testbed to efficiently prove novel designs. We can then extend these designs to deliver proof-of-concept payloads that we can deploy and test on the HAPs themselves, which currently have restricted availability and significantly higher running costs. Prior to the announcement of LabVIEW Communications, we used the open source software package GNURadio with USRP for a few months. We started with zero experience with either software. However, the graphical user interface of LabVIEW Communications, the comprehensive tutorials on ni.com, and the NI technical support channels, provided us with a faster learning curve to implement our applications. Using LabVIEW Communications, we could also program the onboard FPGA without prior experience of VHDL or Verilog, which helped us to easily implement advanced baseband signal processing on the FPGA. By offloading intensive processing tasks, such as fast Fourier transform (FFT) and modulation/coding, to USRP’s built-in FPGA, we increased the determinism, signal integrity, and reliability of the system whilst freeing up the host processor for data logging and simpler processing tasks such as visualising power spectrum and constellation diagrams. The main software defined radio (SDR) kits we used were the NI USRP-2943R and the Ettus Research USRP-N210. Both kits are connected to the ground-based host PCs through Ethernet (the USRP-2943R needs an SFP-Ethernet adapter). To ensure the USRP devices operated correctly while airborne, we had to account for the weight of the payload, power consumption and the connectivity to the host processor. We measured the voltage/current of each USRP device while running applications in the lab and equipped each with an appropriate battery while on the Helikite. To reduce weight and ensure the Helikite could fly safely, we removed the outer cases of some USRP devices. To ensure fast, secure connectivity between airborne USRP devices and the host PCs running LabVIEW Communications on the ground, we used fibre Ethernet. We developed a second winch (separate from the tether winch) to store the fibre, tensioning the fibre loosely on the tether, using a clutch and preventing the fragile fibre from stretching. The fibre Ethernet can achieve 1 Gb/s throughput, which can support multiple USRP devices operating at full duplex. It is always good to know the quality of radio coverage before deploying a base station. In contrast to the well-established terrestrial propagation models, aerial-terrestrial propagation still requires further exploration. We carried out a field trial to measure the signal propagation between aerial and terrestrial terminals. The Helikite carried a USRP-N210 as the receiver whilst, on the ground, a trolley carried a USRP-2943R acting as a mobile transmitter (a transmitter-based experiment on the ground causes less potential interference to other users on the same band). We have measured several propagation scenarios at different elevation angles and distances including line-of-sight (LOS), non-LOS (NLOS) shadowed by buildings, partial LOS through trees, and rich reflection NLOS in residential areas. We are planning further field trials to collect more data to generate appropriate propagation models for each scenario. Given the nature of HAPs (unlike our Helikite test platform), cabled connections to the terrestrial core network are unfeasible. So, the technologies that improve the efficiency of the limited wireless spectrum are particularly beneficial to aerial-terrestrial communications. Our EPSRC-funded NetCoM project has investigated improving backhaul/access link spectral efficiency by using physical layer network coding (PNC). PNC exploits the additive nature of the RF wave to compress the received signals from multiple users into coded data and uses appropriate side information to ensure desired data is recoverable at the destinations. We have tested a simple two-way-relay (TWR) channel using three USRP devices and the Helikite testbed. The TWR channel simulates the scenario where two users exchange data through a relay because the direct link between them does not exist. In the field trial, we have two USRP devices on the ground (as users) transmitting different pilot data simultaneously on the same carrier frequency to a USRP (as relay) on the Helikite. 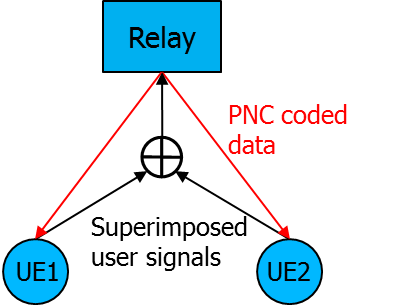 We calculate the bit-error-rate (BER) performance directly from the PNC-encoded superimposed signal. The results show that the aerial experiments have achieved similar BER performance as the indoor experiments (LOS existed in both scenarios), which indicate the possibility of applying PNC technology on aerial platforms. Figure 6. 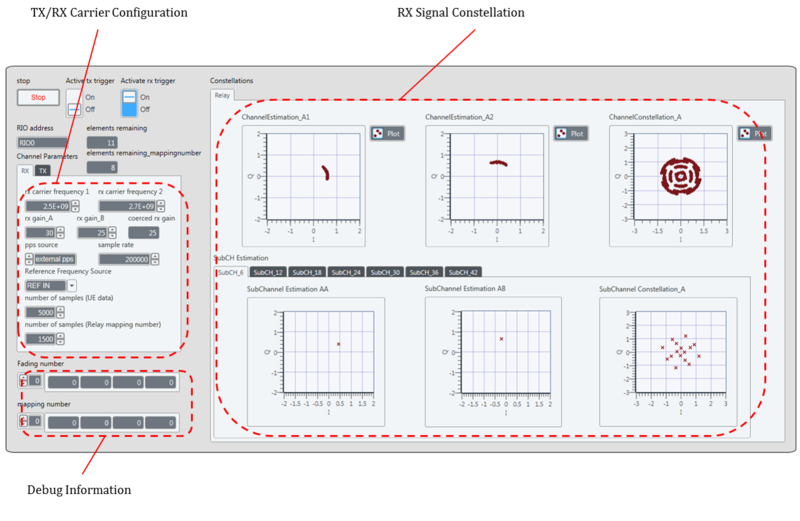 Our LabVIEW Communications GUI displays the superimposed constellation at the Relay Node. Delivering services using shared HAP/terrestrial spectrum will require highly dynamic HAP coverage along with the ability to specifically protect areas from HAP-generated interference. Phased array antennas on the HAP can help achieve tight control of interference, delivering electronically steerable beams can also track the mobility of the users to provide consistent quality of service (QoS). Inspired by an NI case study from Imperial College, which discussed direction finding and beamforming, we extended the phased array antenna testbed to use the array to transmit steerable beams and tested the system both in the lab and on the Helikite. We implemented a similar approach to calibrate the phases of the transmitted signals as Imperial College. As Figure 7 illustrates, we connected the TX/RX port of each USRP daughterboard to one antenna array element and connected the RX2 ports to the phase synchronisation tone generated by the same USRP through splitters. However, unlike Imperial College, we operated the USRP devices in full duplex mode by setting the TX/RX ports to transmit and the RX2 ports to receive. In this setup, the signal transmitted by TX/RX port couples into the RX2 port so the RX2 ports receive both the synchronisation tone and the tone sent by the TX/RX port. The two tones are on different frequencies so that they can be separated by a digital filter. We first correct the phase ambiguities across the RX2 ports of all daughterboards, and then calibrate the signals of TX/RX ports based on the observed signals at the phase synchronised RX2 ports. All the USRP devices driving the antenna array elements are connected to the common 10 MHz and 1 PPS reference signals. We have tested a four-element phased array with the fibre Ethernet backhaul on the Helikite using two USRP-2943R to drive the four array elements and one USRP-2943R to source the reference signals. One USRP-N210 generates the phase synchronisation tone to be distributed to four daughterboards through a splitter. To make sure the payload mass does not exceed the capability of the Helikite, we took off the case of the USRP-N210 to keep the payload weight just below 10 kg. 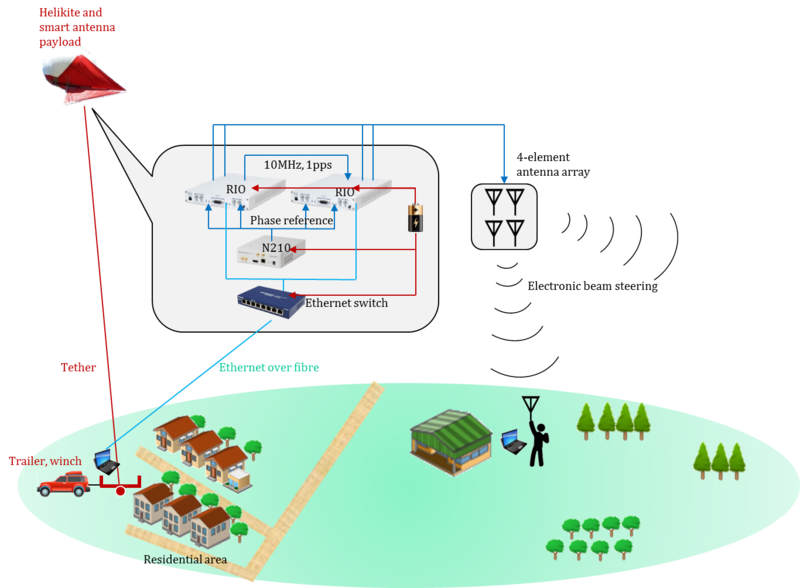 Each USRP device is powered by one battery and all USRP devices are connected to one Ethernet adapter to allow the host PC on the ground to control them through the fibre backhaul, controlled by LabVIEW Communications. During the field trial, we have clearly observed the phased array tracking the arriving signal direction from a moving source (one USRP-B210) on the ground, and the received signal power changes while steering the TX beam of the phased array to different directions. We plan to expand our Helikite testbed by investing in a larger, 100 "m" ^"3" , Helikite that can carry 30 kg payload, so we can complete larger scale experiments. The performances of our current applications are limited by the need to process data on the ground-based PC rather than the FPGA. The recently announced standalone USRP-2974 is equipped with an onboard real-time processor, which would allow us to take full advantage of the built-in FPGA for baseband signal processing, even when the device isn’t tethered to a PC. This would significantly improve the throughput of our applications and allow us to operate our testbed at higher altitudes. We look forward to testing this out soon. S. Priestley, C. Baker, Superfast Broadband Coverage in the UK, House of Commons Briefing Paper CBP06643, 9 March 2017. Real Wireless, Technical analysis of the cost of extending an 800 MHz mobile broadband coverage obligation for the United Kingdom, Technical Report, January 2012. S. Romeo, Overview on Smart Farming, “Technology, Application Areas, Market Landscape and Entrepreneurship”, Beecham Research, 2015.